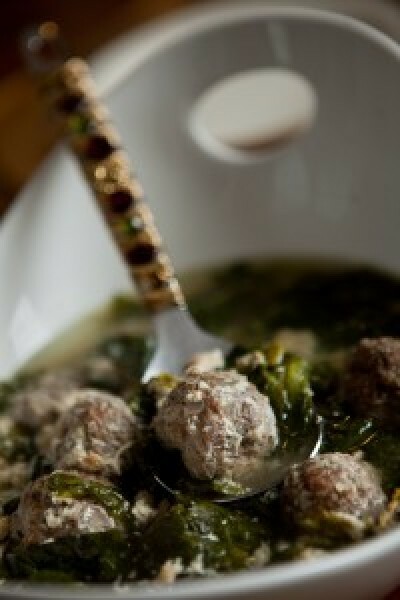 As an Italian I love this Paleo recipe version of Italian Wedding soup, my favorite soup! I don’t feel like I am missing anything with this Paleo soup as it has so many flavors and adding the swirl of eggs at the end really makes this Paleo soup extra special. To make the meatballs: Stir the first 7 ingredients in a large bowl to blend. Add in beef and pork and combine well. Either using a small melon scoop or measure about 1 1/2 teaspoons for each, shape the meat mixture into 1-inch-diameter meatballs. Place on a baking sheet or platter. Take your large pot and add a little olive oil. Heat the pan to medium/high. Drop in each meatball and brown for about 1 minute each side. Don’t cook the inside, just brown. Take out and put back on the baking sheet or platter. Wipe out the bottom of the pan with a paper towel and continue to keep the pan hot. Add in broth and bring to a boil. Carefully drop in meatballs and let simmer for at least 30 minutes to 1 hour. Then add in escarole. When you are almost ready to serve whisk 2 eggs in a small bowl and add to the broth and stir quickly but carefully. Let the eggs sit for a couple of minutes. Taste for salt and pepper. If you are using Parmesan cheese, after you ladle your bowl sprinkle a little on top of the soup! Cindy’s Note: You can use ground turkey for the meatballs. Also, I use other variations for example: If I have carrots and celery in the refrigerator then I will chop one of each and sauté in the pan then add the soup ingredients. You can also use spinach if you can’t find escarole.